In honor of my Mom’s recent visit to Boise, I’ll post her zucchini bread recipe. I’ve been eating this one since I was little, when her garden produced an overabundance of the dreaded green squash. We haven’t had a hard frost yet in Boise, so we’ve still got some of them lingering about. If you want, you can grate and freeze zucchini to make this through the winter. When you thaw it out, be sure to squeeze most of the excess water out of it before putting it in the bread. The cooler fall and winter weather is perfect for baking something warm and cinnamon-scented. Mix well and add to the egg mixture. Stir them together only just enough to combine them. The key to making zucchini bread and other non-yeast breads (like banana, etc) and muffins is to NOT OVERMIX THEM. This way they will rise nicely and be fluffy, not dense. I usually do not use a mixer to make zucchini bread, just do it by hand! 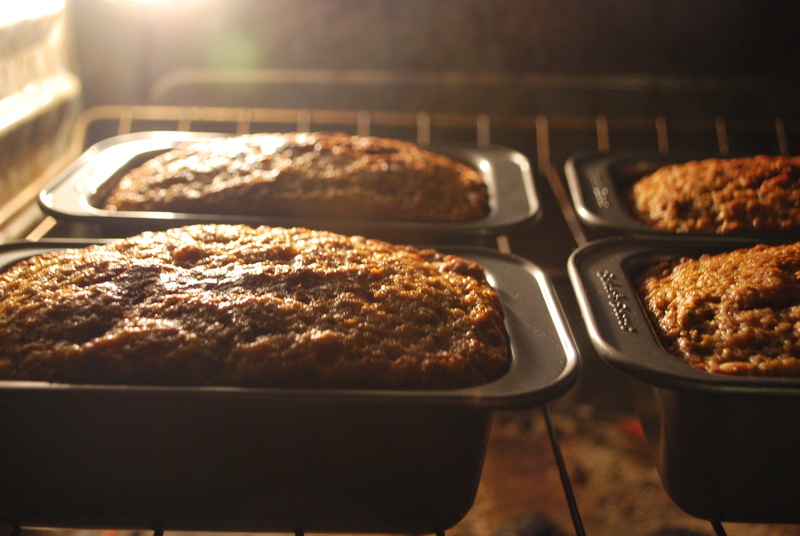 Bake at 375 for one hour in two loaf or four mini-loaf pans. Grease the pans well, and let the bread cool before you try to remove it from the pan. We’ve had some trouble with sticking, and like the mini-loaf pans a little better for this reason. Muffin pans should also work. Serve warm or cold, by itself or adorned. I like it with cream cheese and fruit for breakfast. Marty likes it drizzled with cream for dessert. Enjoy! I promise to post a recipe that isn’t a dessert, soon! Stay tuned for adventures in canning! Tags: applesauce, baking, bread, dessert, fall, freezing zucchini, Katie Painter, zucchini. Bookmark the permalink.